Jonathan boy and myself are a fan of Wyeth. He grew up with Wyeth since he was in my tummy. 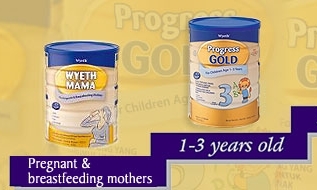 He then started with Wyeth gold series of S-26 (0 – 6 months), Promil (6 – 12 months) and now Progress (1 – 3 y/o). I find that Wyeth has all the nutrition essential for a growing child and not very expensive. Furthermore, I prefer to stay with the same brand for the continuity of its nutrition. Ok, back to the topic. As I am expecting #2, I need calcium. After finishing all the milk samples I received, I bought a tin of Wyeth Mama and placed it together with Jonathan’s milk powder. I am the one who ensure we have sufficient stock and replenish Jonathan’s milk powder when it runs low. The drama happened last week. It so happened that Jonathan boy had not been asking for milk before bed time for 2 days and so I did not check if there are still milk powder left in the tin. The following day, no more milk powder left in the tin and MIL had to open a new tin. You see, Wyeth milk product in tin came with a BLUE lid. MIL noticed a tin of milk powder with blue lid at Jonathan’s food area and thought that was Jonathan’s milk powder and coincidentally it was still unopened. When she opened it, she was wondering why the scoop is different which is bigger and different in colour. She thought it’s a new formula and continue to make milk for Jonathan. When I came back from work, I saw Jonathan’s empty milk powder tin and a foil cover in it. I can sense something is not right so immediately open my Wyeth Mama. Jackpot! It was opened and the foil cover was gone. So Jonathan boy had been drinking Wyeth Mama for the whole day today! And yet he gulped down everything. My MIL can only read simple Chinese character and she didn’t really notice the picture on the tin…a pregnant lady vs. a lion. This entry was posted on Saturday, December 12th, 2009 at 3:30 pm and is filed under Jonathan, Lessons, Unrelated. You can follow any responses to this entry through the RSS 2.0 feed. You can leave a response, or trackback from your own site. omg.. thank got Jonathan is bigger now.. imagine if he is just a tiny baby? LOL !!! I don’t even want to consider the effects! But can’t go very wrong I guess with milk. hahaha… so anything wrong with Jonathan boy?? Looking at the packing, I almost got confused too. Hi, it’s my first time on your blog. I think you don’t have to worry, the major ingredient is still milk. I don’t think calcium is toxic to babies. It will be good for his bone development. I won’t notice the difference too if someone didn’t mention it to me coz both tin really looks so similar, kekekeke …. Oh! Jonathan actually drank Wyeth mama? hmm..